Yesterday and today, we carried on with the task of creating a “work table” to implement our design for our Skylight, all on the ground floor level instead of being 6metres (20feet) up on our roof! 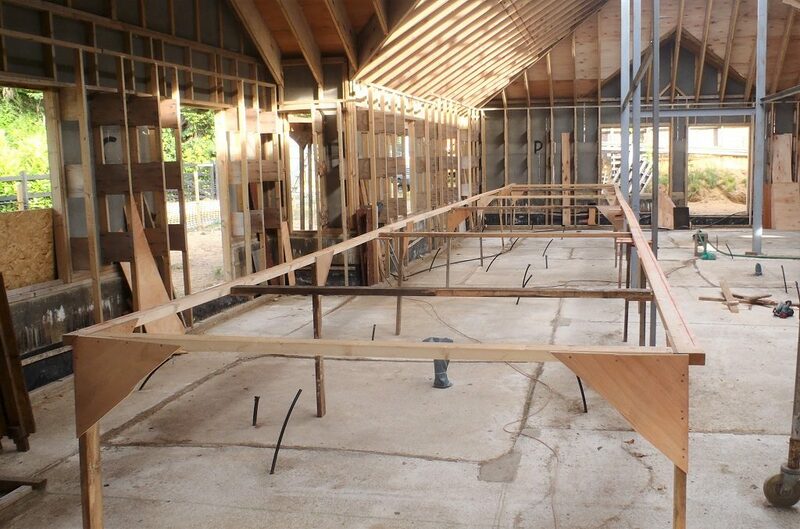 We used seven lengths of our untreated regularised 95mm by 45mm timber planks plus two off-cut pieces to make a framework of 16metres long by 2.5metres wide. This framework is held up on 1.2metres high legs, seven of them down each side and secured into place using lots of triangular plywood pieces to lock and stabilised the structure. Then the two lines were separated by a series of horizontal struts, also locked and screwed together using more triangular anchor pieces. The whole structure was then confirmed to be right-angled at the ends and the long sides were straight (using a string) and then fixed and clamped to the three steel legs which provided a very strong stabilising support for the duration of our work. 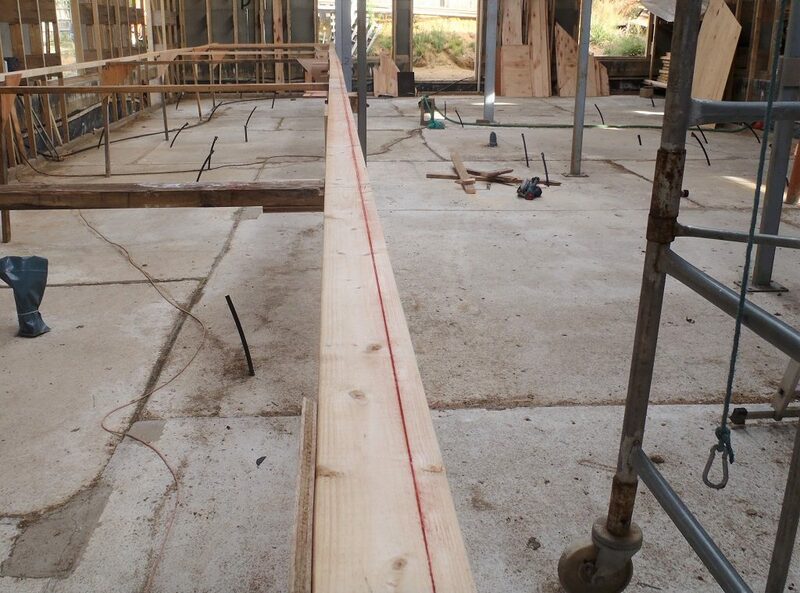 Lastly, we snapped a red chalk line down the length, positioned exactly 2.490metres apart which is going to be our finishing width of our Skylight. On Monday, we will go back on the roof and make sure the “real” Skylight is a proper right angle on both ends and measure the total length so we will know exactly where the ends are positioned, including where the nine steel cross ties are relatively located too, just to confirm against our drawings. Preparation Continues .. Analysis, Calculations, Ordering and Plan B!